Terrie gave Storm and I the option of choosing our route today and when we saw that we could go through Happy Camp on the way west, we pointed the pickup toward CAL Hwy 96 and the Klamath Mountains. Having met so many happy campers in my lifetime, I was anxious to see where they originated. I love this road person/visitor info center – she let me use her personal porta-potty while we waited! 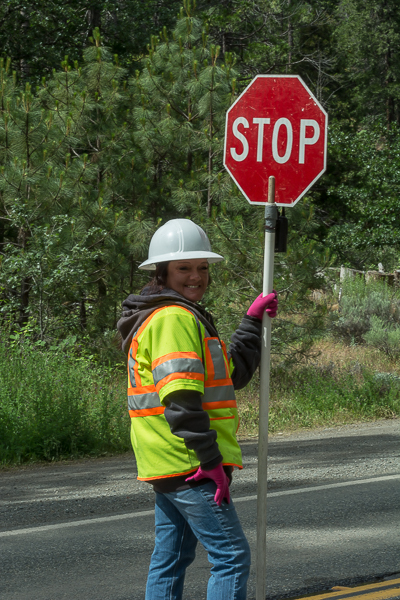 Our first stop was unexpectedly at a road construction site where the traffic control young lady not only stopped us, but she also came over to our vehicle and described to us what was going on around us while we waited for the road to re-open. Above us on the mountain, a logging company was using a helicopter to take out logs as they felled them. She urged us to get out of the truck and get photos of the process. We had seen this on TV, but never in person so we piled out and started shooting. We made it to Happy Camp and immediately started taking pictures of all of their welcome signs, working telephone booths and Sasquatch statues. Happy Campers saw us and stopped to talk and/or to take pictures of us taking pictures. A great time was had by all, but there is a dark side to Happy Camper’s future. When we visited Natural Bridges outside Moab a few weeks ago we learned that a National Park has to be approved by congress, but a National Monument can be created by an Executive Order signed by the President alone. According to information we received from a Happy Camp resident who stopped to tell us that he had created the fingernails and toenails on the Sasquatch statue, since about 2010 the Happy Campers have been fighting a move by the BLM (Bureau of Land Management) to make their valley a National Monument and then to un-dam the river that flows through their valley. This dam removal will flood the area and wash away all of the Happy Campers. Normally I would be all for more National Monuments, Parks, etc., but in this case I tend to side with the Happy Campers. If Happy Camp is washed away so will their annual Labor Day Weekend Big Foot Jamboree and really, can we afford to lose that? ?